THURSDAY, FEBRUARY 14, 2019 FROM 10 AM – 12:00 NOON. It is with great sadness that we announce the passing of Mildred LeBlanc (née Webb), age 81, of Moncton NB, on February 8th, 2019. Born in Halifax NS, she was the eldest child of the late J. Hilus Webb and Mary Somers. The family relocated to Antigonish NS, where she began school. She then attended Mount Saint Vincent Academy in Halifax. At 18, she graduated from St. Francis Xavier University with an Honours BA in Sociology. Too young to study social work, she instead completed an MLS at the University of Michigan where she revelled in the lively learning environment and gained a life-long appreciation of Russian literature. Upon her return, she married J. Leonard LeBlanc and worked in the library at St. Thomas College in Chatham NB. Millie earned a French Immersion diploma from the Université de Moncton. She taught children’s literature for several years at the Université de Moncton and at the University of New Brunswick. Millie was a vibrant and tireless volunteer working for the local community and eventually, the province and nation, primarily for those with learning disabilities. A strong advocate for the rights of those with disabilities, she contributed with passion and determination to the associations that represented those with learning difficulties. After years of service as a member of the Learning Disabilities Association of New Brunswick she served on the board, then as editor of the National Newsletter for Learning Disabilities Association of Canada and became Vice-President, Eastern Region. The NB Premier’s Council on the Status of Disabled Persons subsequently sought Millie’s experience and expertise to inform their work. In recognition of Millie’s outstanding contributions, she was awarded a Canada 125 Medal in 1992, and New Brunswick’s Honorable Andy Scott Award in 2015. 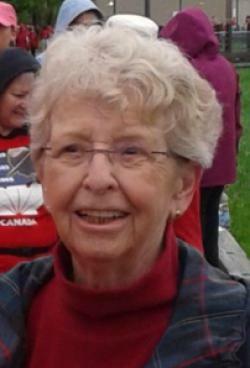 She also contributed to many community initiatives for learning disabilities and for literacy, organized a remedial summer literacy program for children in the Moncton area, mentored families facing difficulties with disability accommodation, and willingly applied her remarkable energy to any worthy initiative to offer hope and assistance. The most unusual among her endeavours was her participation in the Moncton’s Astra Zeneca Legs for Literacy Run in 2012, where she was astonished to win a medal for the 5K race in her age category. Millie was also involved in other community activities, including serving on the board and eventually as president of the Multicultural Association of the Greater Moncton Area. She loved the outdoors – gardening, camping, hiking, snowshoeing and especially the beach - whenever the chance presented. She also enjoyed involvement in a walking group that covered many kilometres of the city while making lively conversation. Infallibly up to date on the news, she was always ready to win a debate. A proud grandmother at music, dance and sports events, she also enjoyed conversations with her grandchildren on many subjects. Millie was predeceased by her brother Father Jim Webb, S.J. She is survived by her devoted husband of 59 years, Len, brothers Hugh Webb (Marilyn) and J. Tom Webb (Marian), four children Tess LeBlanc, Connie LeBlanc (Robert Chan), Vanya Ewart (Stephen) and Misha LeBlanc, four grandchildren, Bridgette and Alexander Chan and Fiona and Liam Ewart, and several nieces and nephews. Millie appreciated the care of her pharmacist, the oncology service at Georges Dumont hospital and the expert and compassionate care provided by the nursing staff in both the Geriatric and Palliative Care Units of the Moncton Hospital. She was also grateful to her home caregiver and housekeeper, Dianne Levigne for her kind assistance. Their sincere efforts contributed to her quality of life as she dealt with declining health. A visitation to celebrate and share memories of Millie’s life will be held from Fergusons Funeral Home Reception Centre, 1657 Mountain Road, Moncton (858-1995) on Thursday, February 14, 2019 from 10:00 am - 12:00 Noon.